We've been due for a full post explaining how all game mechanics work for a LONG time. Most high level players understand how the basic mechanics work, but there are some aspects that are still unclear for a very large proportion of players, including high level ones. Here is what will hopefully be a comprehensive thread explaining all in-game mechanics, and also a full DPS formula which can be used to work out the general DMG output of a hero, and what buffs provide the biggest overall DMG increase for almost any scenario. A hero's final ATK value is the result of their Base ATK, added and or multiplied by what ATK buffs you've applied. A hero's base ATK is fixed and depends on the hero's level. For example, a level 1 Savage Chief has a base ATK of 540, which increases to 550 at level 2 and so on until level 200, where his base ATK reaches a maximum of 5360. Every hero has a different minimum and maximum base ATK and HP. You should note that this means any increases in %DMG are much more significant than the same percentage increases for ATK, since ATK buffs are only increasing the base ATK, whereas DMG buffs are increasing the final ATK value. This decreases the amount of DMG received by the hero, however it can be more simply thought of as a HP modifier. This is because the enemy will need to hit your hero with more attacks than they normally would to kill them, which is essentially the same as your hero having a larger HP. Because of this you will not see the actual HP of your hero increase with DMG reduction, but it will show in battle when your hero takes more hits to kill. For example, consider a hero with 10,000 HP that has 0% DMG RED, and an enemy hero with an ATK of 2000. When the enemy hero attacks yours, it will take exactly 5 attacks to kill your hero. Now consider the same hero but with 75% DMG RED. The enemy's attack is being reduced from 2000 to just 500, so it will now take exactly 20 attacks to kill your hero, which is 4x more hits needed than before, and so has the apparent effect of increasing your hero's HP by a factor of 4. You should also notice that this means you could achieve a 100x HP multiplier at 99% DMG Red right? Not quite. There is a maximum amount of %DMG reduction allowed in game, and it is thought to be around 92-95%. Some DMG Red buffs already in game go up to 90%, so we know it is at least 90%. Your hero's dodge rate is the amount of hits your hero will be able to dodge and hence not take damage from. If you have a dodge rate of 25%, then you will dodge 25/100 (a quarter) of the hits against you. Dodge rate is also thought to have a maximum amount, around the same as DMG Reduction to prevent hero's from taking little to no DMG from attacks. It is important to note that you cannot dodge attacks from buildings or mercenaries. Only hero-on-hero interactions are subject to dodge-hit mechanics. Your hero's hit rate is a direct counter to your enemy's dodge rate. If your enemy has 25% dodge rate, and your hero has 10% hit rate, your enemy will have their dodge rate reduced by 10% to 15% dodge. This should also not be confused with your hero's ATK Rate, which will be discussed further down. Your hero's CRIT rate is a measure of how often your hero's attack will register as a critical hit. All critical hits are 50% larger than the hero's normal DMG value. A critical hit rate of 25% means that 25/100 times your hero will perform a critical hit. For example, if your hero has an ATK of 12,000, they will perform a critical hit of 12,000*(1+50%)=18,000 DMG every 25/100 hits, which is the same as 1 out of every 4 attacks. Just like hit rate is the counter to dodge rate, CRIT resist is the counter to CRIT rate. If your enemy has 25% CRIT rate, and your hero has 10% CRIT resist, your enemy will have their CRIT rate reduced by 10% to 15% CRIT rate. CRIT Bonus is an additional percentage added on to the already 50% CRIT multiplier. Where the initial CRIT DMG formula calculates the absolute damage of a critical hit, the AVERAGE CRIT formula averages the DMG dealt over all attacks, allowing CRIT RATE to be included. SPD is the speed your hero travels at, and varies between heroes. At the bottom of this post there is a table showing each hero with their base SPD values. When a hero's SPD is increased by e.g. 50%, it is multiplying their base SPD value. For example, Pounder has a base SPD of 40, so a 50% increase would be 40*(1+50%)=60. There is also a maximum SPD value of 200 that heroes cannot exceed. However few heroes/mercenaries can actually reach beyond this. Just like SPD, each hero has a unique range at which it can attack targets from. The smallest range value is 15 units for melee heroes, and 120 for most ranged heroes. The same table at the bottom of this post shows the different ranges each hero has too. You should notice that all range values are also measured to the same scale as building ranges are. Your hero's power isn't mentioned to have any benefit in-game, but it is in fact responsible for modifying your hero's ATK value depending on what enemy you're currently attacking. If your hero has a higher/lower power value than the target it's attacking, their total ATK value (Not base ATK!) will be increased/decreased by a certain %. This ATK buff maxes out when your hero has a +1250 or more power advantage, which will result in your ATK value being increased by a maximum of 50%. 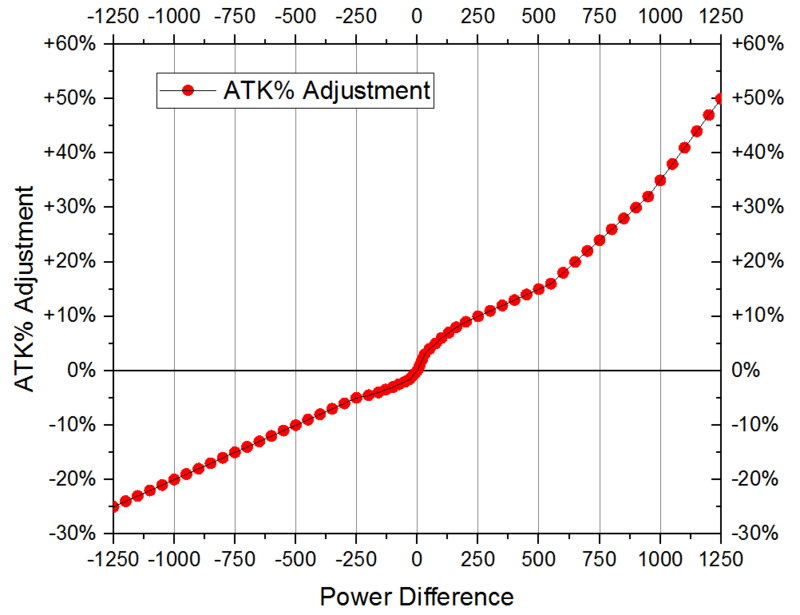 Conversely, there is also a minimum power difference at -1250, which decreases your ATK value by a maximum of 25%. So for example, If your hero has 600 power and 10k ATK, and the enemy hero has 900 power and 10k ATK, the enemy has a 300 power advantage, which means their ATK is increased by 11%, and your hero's ATK is decreased by 6%. Your hero's ATK will then be decreased to 9,400 whilst your enemy's ATK will be increased to 11,100. You can see that having a lower power value doesn't decrease your ATK by too much, and the rate it decreases by with power is also constant. However, the ATK multiplier increases exponentially the larger the power difference is, so ideally you want to get your hero power as large as possible for the highest ATK DMG! Although not official information, this power buff is very easy to test and is why I've been able to gather as much data as I have on it. I'd also encourage you to test this yourself with an Abyss Demon and equipment only on his aids against a neutral base with low level heroes and no equipment - you should see that the DMG he does to buildings is just his regular ATK*(DMG BUFFS)*(HEAL%) whereas the DMG he does to heroes will be ATK*(DMG BUFFS)*(HEAL%)*(POWER MODIFIER) which you can find from the table above according to his total power. This is by far the most complicated mechanic, and this is exactly why I've saved it for last. Attack rate is the number of attacks a hero can make per second, and is dependent on how fast each hero takes to complete each attack. Each hero has a particular attack time and cooldown time that fall into 3 tiers. For most ranged heroes, Ta=180 and Tc=720 (values are in milliseconds), for most old flyers and some ground heroes Ta=200 and Tc=800, and for most melee heroes Ta=300 and Tc=1200. The full info-table, along with all the hero SPD values, ranges, base ATK rates and max ATK rates is at the bottom of this post. Once the attack rate buffs, r, hits 100%, the cooldown time is completely cancelled out, leaving only your hero's attack animation time. Because of this, once +100% in-game attack rate buffs are reached, the hero's actual attack rate cannot be increased any further and it's final max attack rate is dependent only on the attack animation time of each hero. From this you can also see that the closer we get the attack rate buffs, r, to 100%, the more exponentially the overall attack rate grows. Because of this it is extremely beneficial to get a hero's attack rate as high as possible. DPS is the amount of DMG your hero deals per second in battle, and is the result of your final ATK value when your DMG buffs and attack rate are accounted for. Here DPS is the average DMG dealt by a hero, per second, by the hero's normal attacks. This formula also works for mercenaries when the CRIT formula is removed. The DPS formula can be used to work out what buffs will be most effective for a given hero by inputting all the necessary variables to get your base DPS, and then adding what buff you want to compare for a new DPS value. 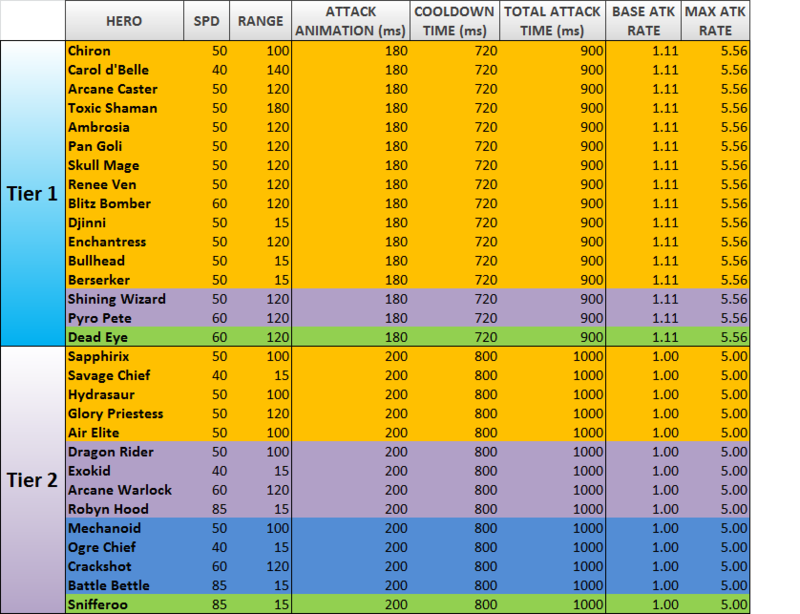 The table has been arranged in order of Base ATK Rate, and organised into tiers that correspond to the set of attack and cooldown times for each hero. Hopefully this thread will serve as a relatively simple but also comprehensive guide, as well as clear up a large number of misconceptions made regarding these game mechanics. I plan on going into much more depth regarding the DPS formula and how it can be used in a future post, however with simplicity in mind for this guide I've presented just the formula. Thanks for the great write-up Wheelie! great post, i was always questioning the game mechanics of atk rate. i find it weird though that they would make skills/divine for skull mage that exceed the max cap without any buffs. may i ask how you came up with the Tc and Ta time constants? All hero details including SPD, ranges and time constants are from IGG data. Yes! This is an interesting point that I haven't seen mentioned before but does exist in the game. All mercenaries that have DMG or DMG Red talents active also receive a certain amount of DMG reflection. As far as I know, this DMG reflection value is constant and does not increase with talent level. Could you please make the same table for mercs. I'm sorry for not thanking yet. Thanks a lot Wheelie! You did a great job! what does the "time cooldown" mean sir ? Could you also add few words about Power (weapons), if it's not a problem? How big boosts does it give and are those boosts calculated in the same way everywhere - i'm asking that, because for example in Coliseum info it says power play there "even a bigger role", while in HT info it says "power will be greatly increased"
Good point! I just finished explaining it in another thread actually, so I'll copy it across. great additions to the post, this should be a sticky. some of the my guildmates have noticed the proc rate of tyrants brand changing depending on level of competition that they face. it seems to proc more often on lower level heroes and less on high level heroes. do you know if there are any factors that affect the chance of this proc other than the weapon level? does team level, hero level, crit resist, hit or any other factor play into this calculation?